Where do I stand now for getting back into the Beta? No idea! I’m still trying to find out myself, but I’ll keep trying and I’ll keep you posted. Bah! Sometimes in life, it’s the small setbacks that can either motivate you or break your spirit down. So rather than mope around and have a pity-party about my problems, I’ve decided to turn my sad, unfortunate tale into something fun and positive. Who in the hell doesn’t love a good contest anyway? Am I right? You may have read a few of my other posts and segments called, “What Not to Wear for Warlocks” and I hope you enjoyed them. Don’t worry, I plan to do more in the future just to keep reminding everyone how important it is to look good while your being bad. 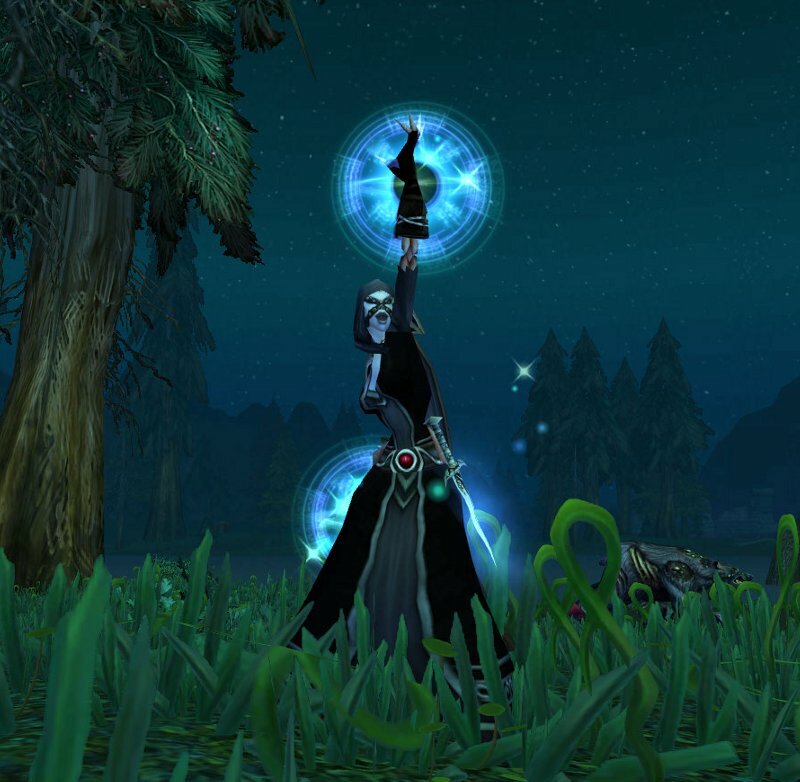 You may have also participated or followed Saga over at Spellbound when they hosted, “The Worst Warlock” Tmog contest, and I’m sure we’ve all seen some pretty pathetic looking ‘locks making us shake our heads, and wishing those players would re-roll a mage or a spriest. After reading about Saga’s contest, I soon found found myself wondering why we don’t see more good warlock Tmogs? Hell, why don’t we see any great warlock Tmogs? So the name of the warlock contest is called: The Epitome. For those of you like me, who have to dust off their Webster’s Dictionary, here is the definition of an Epitome just as a quick refresher course. Epitome (e-pit-o-me) [ih-pit-uh-mee] -noun. 1.) a person or a thing that is typical of or possesses to a high degree the features of a whole class: She is the epitome of darkness 2.) a condensed account, especially of literary work; abstract. Pretty simple, eh? Email me a picture of your Tmog outfits that you feel are the epitome of warlock greatness and how you believe our class should best be represented to the public. Like all contests though, there are some rules and of course, a great big prize for the winner. The winner, after the announcement, will be emailed their prize of a digital code for 1 (one) out of any of these three fabulous mounts of their choosing: Hearth of the Aspects Mount, Winged Guardian Mount, or the Celestial Steed Mount. As you can see by the contest rules, I don’t want to see several thousand Malefic or Rainment sets. Get creative with your Tmog and if you do plan to use any single piece from either a Tier, Tier recolored, or PvP set, I would suggest making sure it doesn’t override the rest of your “theme” or look. The contest is about showcasing ‘locks and not about highlighting a single piece of gear. Mix and match and go crazy with your creativity! The judges of the contest will be yours truly, along with two other anonymous warlock friends of mine who will remain unknown until the contest is over to help remain impartial in their judgements. If you have any questions about the contest or its rules, feel free to contact me via email or Twitter and I will post your question here on this post in a FAQ section for others to view as well. Until then, have fun and good luck and don’t forget to make our class proud! I got a ping-back from your blog and I just want to say thanks for the plug :) Your my first ping-back! Ha! I know I’ve already tweeted you about your appearance on the TNB and I really enjoyed listening in – Keep up the great work! Query — do your rules mean that there can only be one item from any given Tier/Tier-recolor/PvP/green set, or only one item of that type, period? I imagine filling out a set might be kind of difficult if one could use only one item of each type, period, because that’s not enough types of items to fill out all the necessary slots! So, for example, could I use one item of T2, one item of recolored T6, one item from PvP season 7, one item from PvP season 11, one item from green set A, and one item from green set B? Good question and I’m sorry if I didn’t clarify better and you were correct in your example as well. I know a lot of warlocks love the Malefic set and it’s recolors. Rather than have four people all dressed up in one particular gear style I’m only allowing 1 item from each set. It’s kind of hard to judge creativity if four people are all wearing the same Malefic items and the only differences amoung them is their weapons and race. So yes, you use one item of T2, one item of recolored T6, one item from PvP season 7, one item from PvP season 11, one item from green set A, and one item from green set B. Another example I’ll use is what my warlock is wearing now. Amijade, is wearing (my favorite) the entire Silver-Thread green item collection. However, for the contest I would only be allowed to wear only 1 of those items, while the rest of the remaining slots would have to be mixed and matched from other items or sets that are not Silver-Thread. I hope this helps and if you have more questions, please let me know. Also, I’d recommend MogIt for all your transmog needs :P You can find it at: http://www.curse.com/addons/wow/mogit Thanks for stopping by and good luck! Thanks for the ping-back :) You know the worst part? We still don’t have one contestant that has entered… So the prize is truly up for grabs! Thanks! I wish I could take credit for the idea, but I kinda stole it from Saga over at Spellbound from her “Worst Warlock” contest. Sadly, I didn’t get a chance to participate in it. I really appreciate your stopping by! I completely understand about farming good Tmog items trust me on that one! I’ve come to find that if Wowhead says the item has a 10-15% drop rate they really mean it’s less than 3%! Bah! RNG is never good to me! Meh – what can you do other than have fun, right? Good luck if you enter!